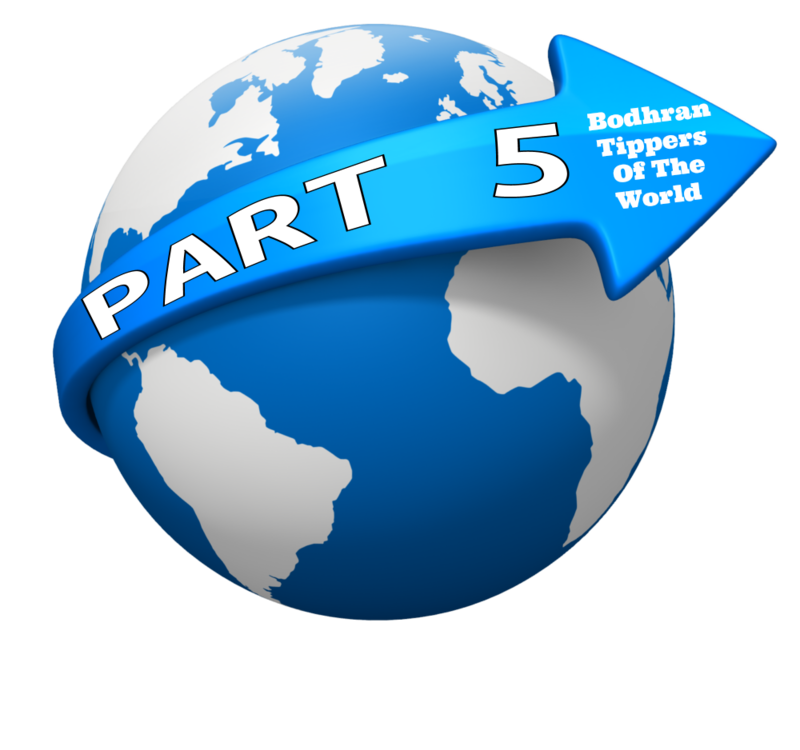 Wow, just when you think you’ve seen it all even more cool bodhran tipper collections keep pouring in from around the world. Thanks to everyone who has taken part in this fun project. I highly recommend clicking on the pictures for a great close-up view and a better appreciation of the collections. 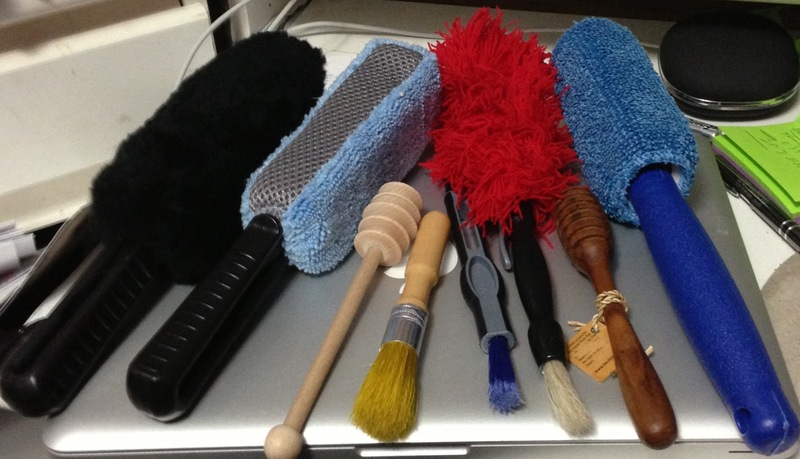 Here are most of my tippers – the ones I use from time to time. There are more!! 20 & 21. The T-Shaped key was turned by A&J and the bulb-shaped one is by Paul at Irishbodhrans. Thank you for all your help with video lessons and the informational emails. 9″ double ended “E-Notch” style tipper made from Lemon Wood by Ken Larson. 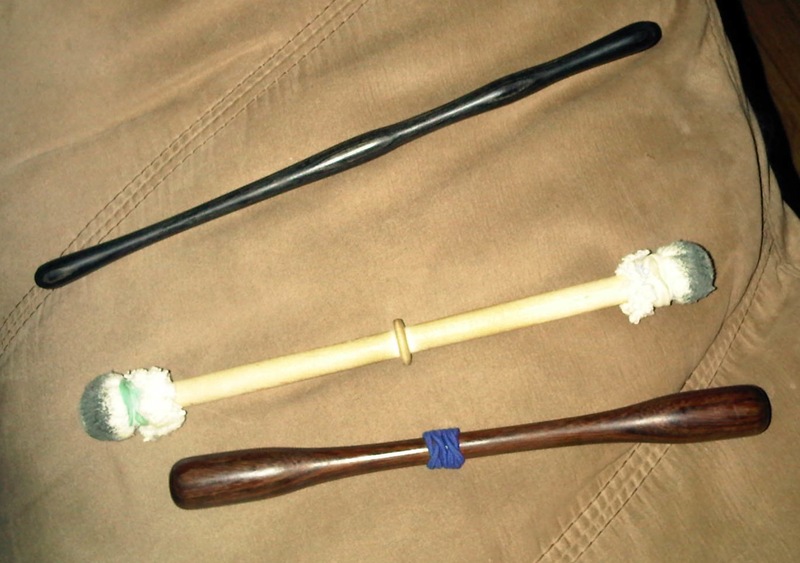 8″ long double ended tipper made from a wooden dowel with padded leather ends. I never sent the tippers before because I only have two and they’re not that special … although they’re special to me. Bamboo Rod Brush: 9” x 9/16” dia., 24 gr. ; flat end; made from 19 small diameter skewers bristles. Bamboo Rod Brush: 9 1/4” x 5/8” dia. ; 30 gr. ; round end, made from 19 medium diameter skewer bristles. Ting Ting Tipper Brush: 9 1/4” x 1/2″ dia. ; 24 gr. ; made from floral Ting Ting bristles. Split Bamboo Brush: 9 3/4” x 5/8” dia. ; 37 gr. 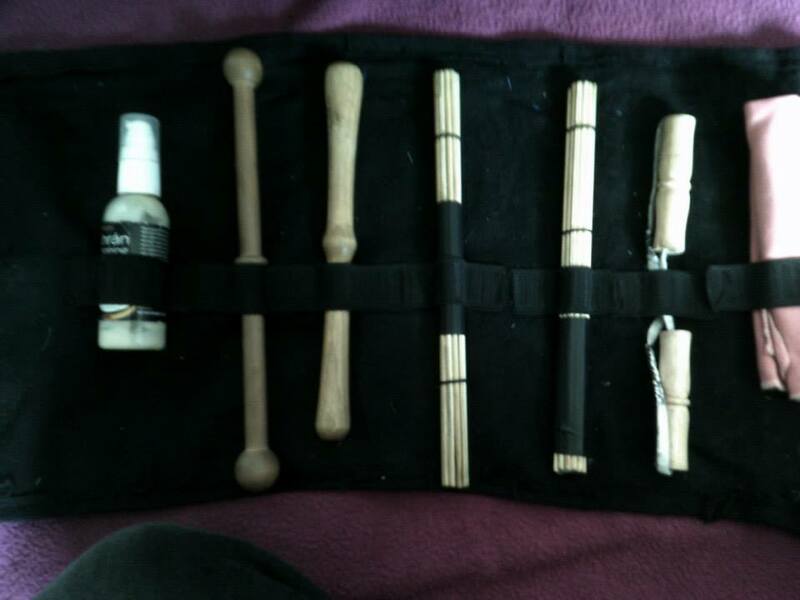 ; made from finely spit bamboo bristles. Nylon Brush: 9 3/4” x 1/2” dia. ; 29 gr. ; made from .094 plastic bristles. Nylon Waltz Brush (Boom-Chee-Chee): 10 1/4” x 1/2” dia. ; 37 gr. ; similar to #5 with 1 1/4” medium felt ball on top end. Felt Ball Tipper: 9” x 3/8” shaft with center bead; 34 gr. ; 1” medium felt balls; rosewood. Teardrop Tipper: 9” x 3/8” shaft with center bead; 1/2” ends; 28 gr. 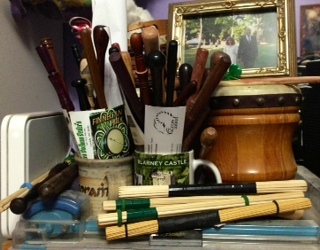 ; rosewood; my standard most used tipper. Teardrop Tipper: Same as #8 but in ebony; 24 gr. (unwrapped). Heavy Teardrop Tipper: 8 3/4” x 3/8” Center shaft with center bead; 5/8” ends; 32 gr. ; rosewood. Trumpet Tipper: 9” x 3/8” shaft with center bead; 9/16” ends; 24 gr. ; ebony. Teardrop Tipper: 9” x 3/8” shaft with two beads 3” apart; adjustable o-ring at center; 1/2” at ends; 25 gr. ; ebony. Lightweight Combined Style Teardrop Tipper: 9” x 1/4” shaft with adjustable o-ring; 7/16” ends; 13 gr. ; IPA. Combined Style Teardrop Tipper: 10 ¼” x 3/8” shaft with adjustable o-ring; 1/2” ends; 18gr. ; ebony. I use “Ahead Grip Tape” drum stick tape for taping my tippers. Wrapping adds approximately 2 gr. to tipper weight. N-EF 4: Original Mexican Fiber Brush Tipper; 23 cm long plus brush; 20 gr. ; ebony. Neat sound. Love playing it. N-EF 8: Split end tipper with built-in beach center; 24 cm long; 18 gr. ; ebony. ME-A: Single ended and combined syle tipper; 26 cm long; 9.5mm at tip, 7 mm smallest to 14 mm; 190 gr. ; ebony. ME 12: “Tear drop head” 25.5 cm long; 16 gr. ; ebony. SW 3: “Topend and Trad/Kerry Style” tipper; 23.8 cm long; 17 gr. 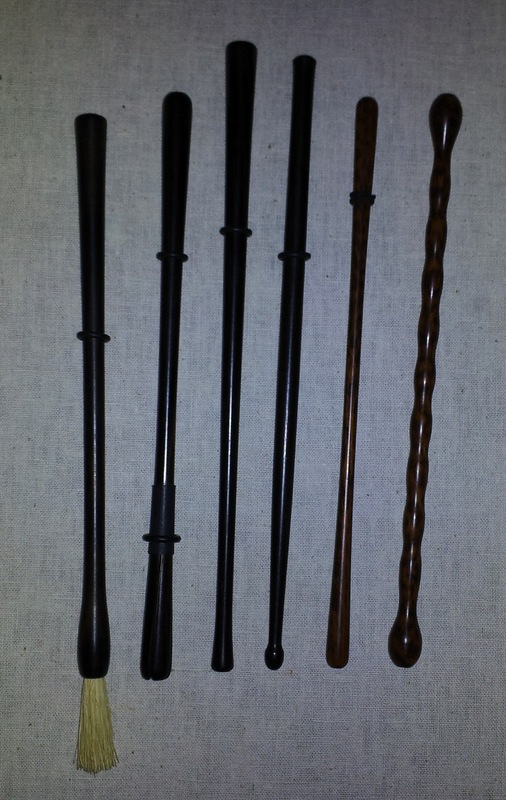 ; Snakewood. SW 6: “Topend and Trad/Kerry style” and “combined style” tipper; 24 cm long; 20 gr. 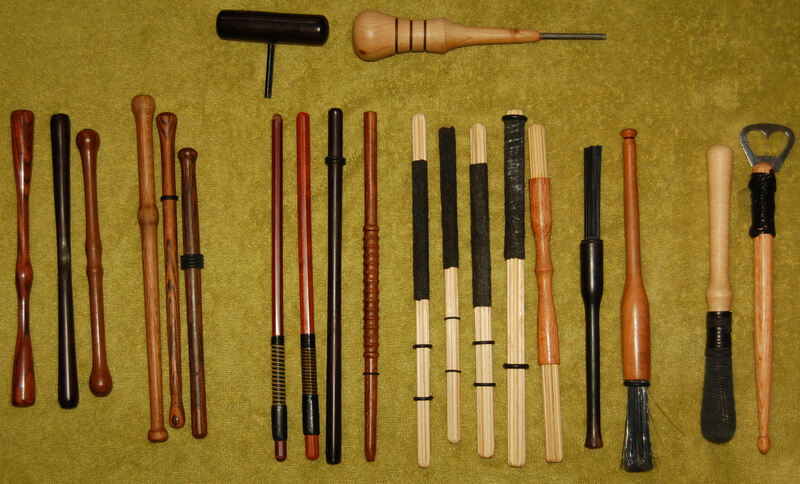 ; Snakewood. Bones: 5 ¾” long; made from dog chews from local grocery. 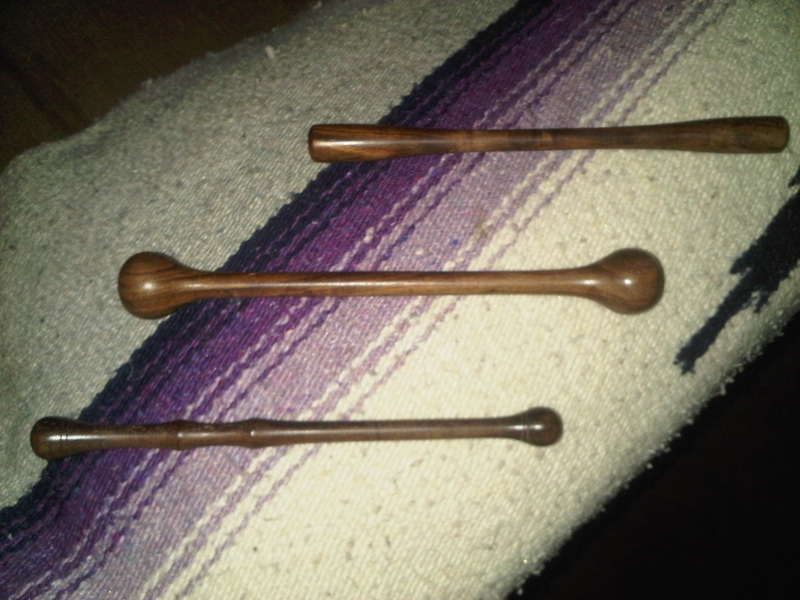 Wooden Spoons: Made by a friend of mine, Bill Bear; Chinaberry wood. Kick Stick: 10 3/4” long; 1 1/4” dia. ; 83 gr. ; I turned from hollow bamboo. Sound Pipe: 10” long; 1 1/2″ dia. ; made from chrome drain pipe. Rawhide Egg Shakers: made by NINO. Wood Cylinder Shakers: 4 1/4” long; 1 5/8” dia. ; made by Rhythm Fusion. 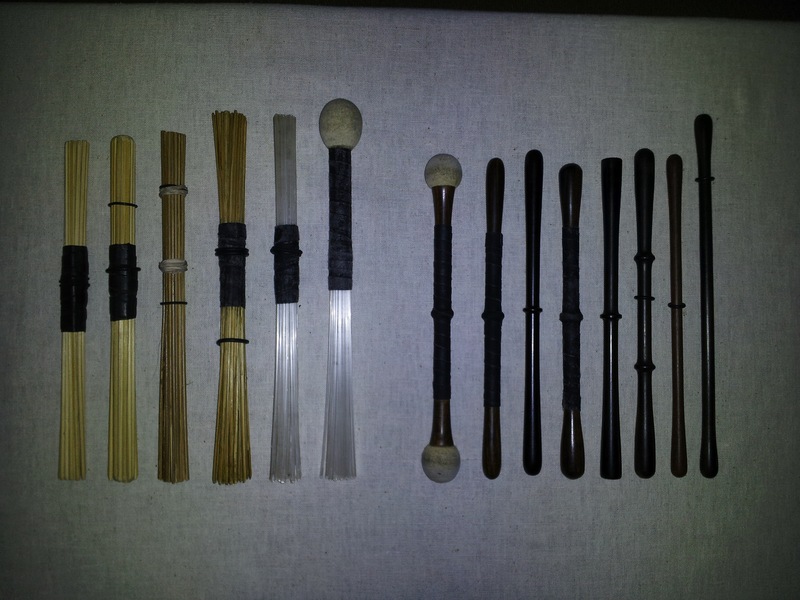 Various wire and nylon drum stick brushes (not shown). The Laptop by Rhythm Tech. 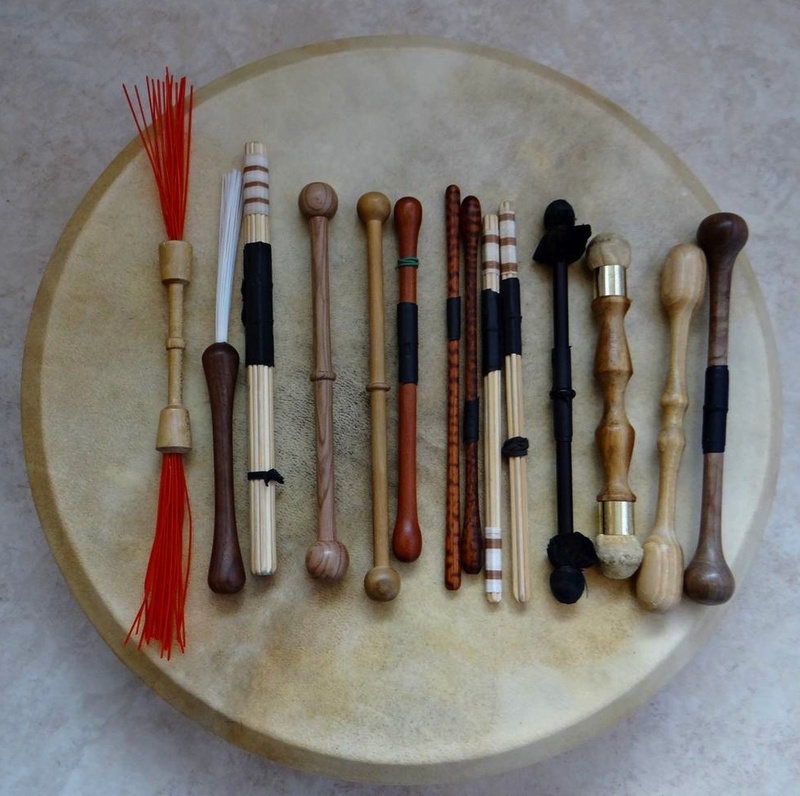 Play like a Bodhran or a snare drum. Main drum I play is an Eckermann 39 cm x 10cm, tunable double goatskin. The second most played drum is an Eckermann 42 cm x 10 cm, tunable double goatskin, tuned lower than the first for contrast between songs. I also have an Eckermann 35 cm x 10 cm, tunable double goatskin. And I also have an Eckermann 45 cm x 10 cm, tunable single goatskin. (Note: All 4 Eckermann bodhrans “nest” inside each other in one case). Albert Alfonso 16” x 4 3/4″, tunable single goatskin. Brendon White 18” x 6”, tunable double goat skin. 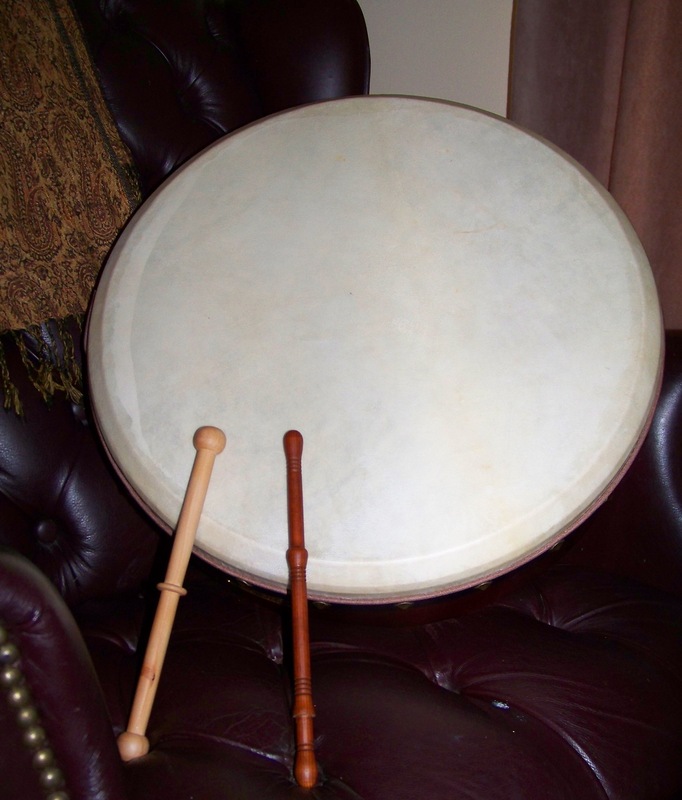 My First Bodhran, like you, was an 18” x 3 ½” non-tunable Pakistan type frame drum. (hole by grandson). 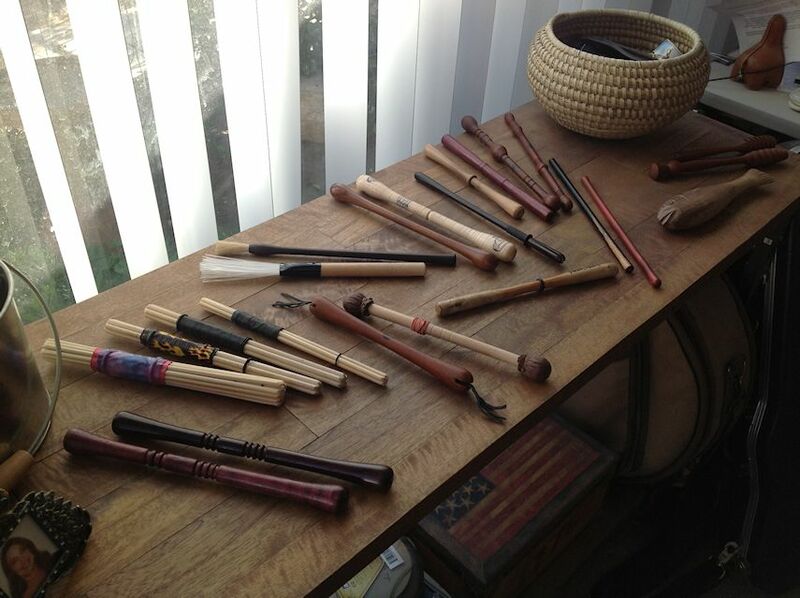 I play, Traditional Irish – Plus, regularly with Chris Morgan and Darin Graves around Central Florida. Ebony top-end tipper by Albert Alfonso. I haven’t learned top-end playing (yet), but still use this in certain settings for a nice crisp attack and pop that cuts through lots of instruments. 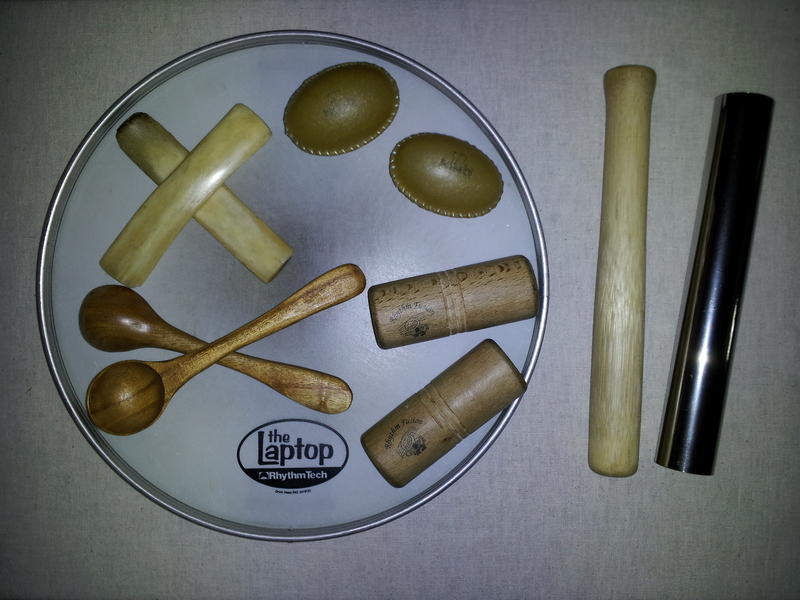 This is the generic tipper that came with my first Walton bodhran–modified since purchase, as you can see, to be quite fancy. I cut the toes from a pair of my husband’s white socks, and bound them down with a couple of rubber bands from the Sunday Washington Post. Surprisingly, it was a very effective change, and brought out a beautiful bass I never expected! I have worn the decal almost off the drum with this one–that’s the dark green stripe around the ball. I found this in a fabulous DC music and instrument store, the House of Musical Traditions. It was beautifully balanced and heavy in the hand–this is one that got me my first triplets! The extra weight just pulled the top end over like magic. Boom! Has a nice solid strike against the skin. Thanks for being such a great teacher and encourager! Of this lot my favourites have to be the snakewoods for top-end and largely replace the weighted rosewood in the centre of the shot. The home made bbq skewers come a close second. 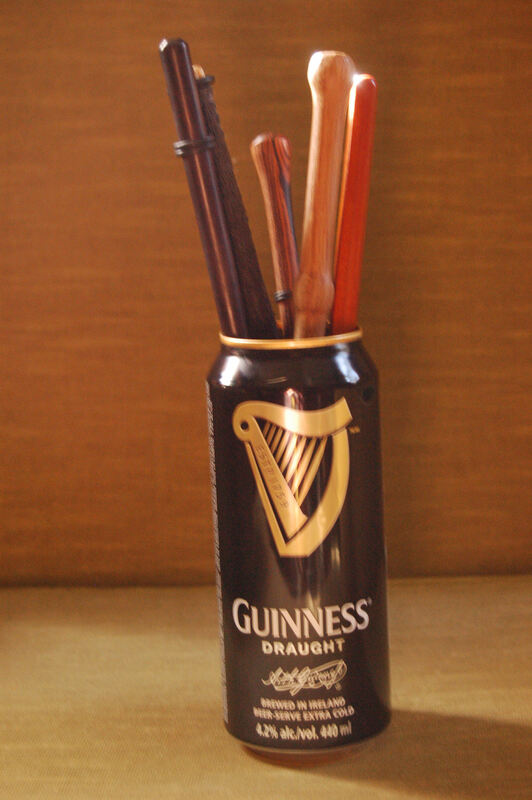 The small brush fills in on our waltz sets beautifully and the leather covered tippers certainly add something to a LOUD Irish session. I have an 18″ Waltons Bodhrán. 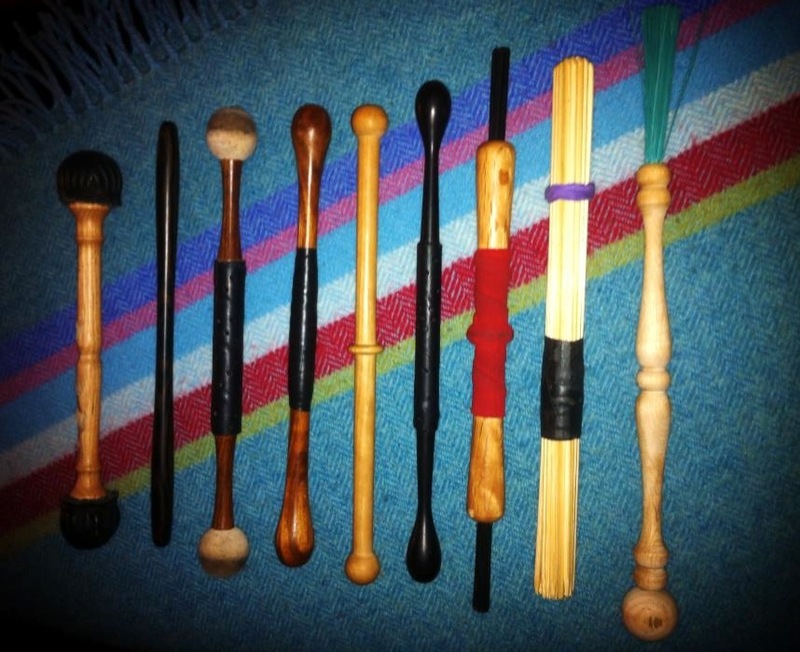 If you have any of the tippers featured in the collections or want to share insight that might be useful to your fellow drummers please leave a comment below.